And when was the last time your family willingly downed a pound of Swiss chard? You have to try this one! Tip: I might actually prefer this soup the second day. Some soups age well and this is one of them. So if you want to, make it ahead! Heat the oil in a heavy large pot, over medium heat. Add the onions, carrots, celery, pancetta and garlic. Saute until the onion is translucent, about 10 minutes. Add the swiss chard and potatoes and saute for 2 minutes. Add the tomatoes and rosemary sprig. Simmer until the swiss chard is wilted and the tomatoes start to break down – 5 to 10 minutes. Meanwhile, blend the can of cannellini beans and 1/2 cup stock in a food processor until smooth. Add the remaining beef stock, bean puree, and parmesan rind to the beef mixture. Simmer until the potatoes are tender, about 15 minutes. Stir in the parsley. Season with salt and pepper. Remove rosemary stem (the leaves should have fallen off) and Parmesan rind. Sprinkle some grated Parmesan on top and serve with crusty bread. Enjoy! 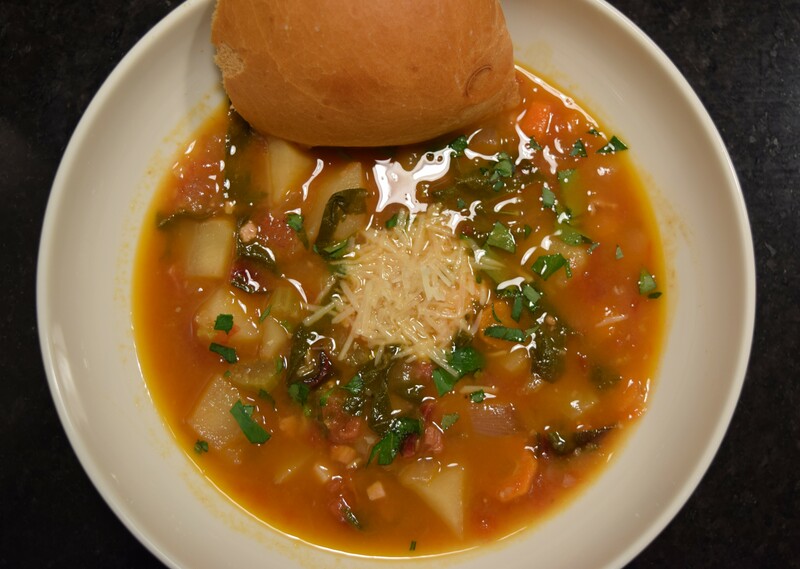 Tags: hearty meal, italian dinner, minestrone, one pot meal, winter minestrone. Bookmark the permalink. I have been looking for a minestrone soup. This sounds good and delicious!